Access to the right information at the right time and place is an indispensable condition for successful decision making. Every day many different business events and changes take place in the CRM system (e.g. creating a lead, sending and receiving emails, changing client’s status, creating notes, registering cases and much more). SugarCRM users often need to review such information, but finding the necessary data may be time-consuming as it requires manual sifting through different modules, reports, records and subpanels. TimeLine Viewer was created to address this issue. This SugarCRM plugin allows you to store and view overall history of communications in a single window in the most convenient way – on the timeline. The distinctive feature of TimeLine Viewer is its unparalleled flexibility. With the help of the SugarCRM plugin, users can define the most valuable and important events themselves, filter them, view details of events or consolidated information for several entities, use obtained data for building reports, interact with colleagues, etc. Due to mobile responsive design, users will be able to access the necessary information in a few touches wherever they are – on the way, at home or in the office. scratch without any programming knowledge. TimeLine Viewer is also a powerful collaboration tool. This SugarCRM plugin allows users to comment on events, referring to colleagues and, if necessary, giving links to the necessary objects. The mentioned colleagues will immediately receive the notification and will be able to easily navigate to the desired object or content. Such approach significantly improves team selling and helps you close more deals. 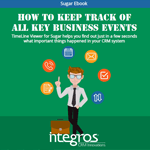 This short SugarCRM ebook shows how to find out just in a few seconds what important things happened in your CRM system with the help of TimeLine Viewer.